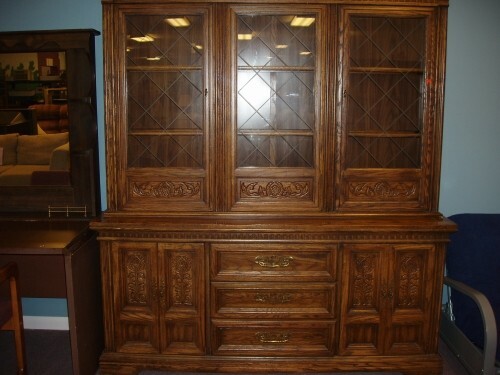 Large, wooden display case with lots of shelving and tons of storage. Three glass front cabinets on top and two smaller cabinets on bottom with three drawers. Habitat for Humanity of Greater Ingham County seeks to eliminate substandard housing in the rural areas of Ingham County. This community organization brings neighbors together to help neighbors in the belief that simple, decent and affordable shelter is crucial to the health and long-term success of families and communities. Habitat for Humanity is a Christian housing ministry founded on the conviction that every man, woman, and child should have a simple, decent place to live in dignity and safety. Habitat has an open-door policy: all who desire to be a part of this work are welcome, regardless of religious preference or background. We build with people in need regardless of race or religion and welcome volunteers and supporters from all backgrounds. HFHGI builds new homes, renovates existing houses, performs major repair projects and constructs wheelchair ramps with low-income families in need. You can join your neighbors and get involved in the important work of Habitat for Humanity! Make a donation, volunteer your time or services, shop at the ReStore, help with fundraisers â€” everyone has something they can contribute!